I recently spent two weeks visiting several of the Hawaiian islands, and more miles in a car than I thought possible. 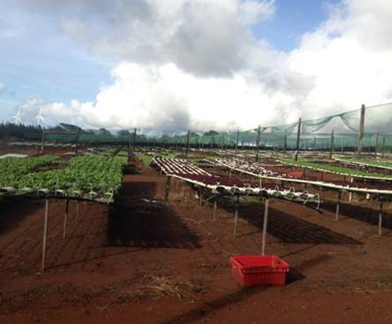 · Even with a twelve-month growing season, I was surprised to learn that Hawaii imports 85% of its produce (The University of HI plans to conduct a new survey around this import figure). · Much of the produce grown, primarily lettuce and greens, is sold to the resorts for fancy salads for tourists. Here at Johnny’s, 10% of our total lettuce sales are to Hawaii. · Some crops are not cost-effective to grow in Hawaii, or are difficult to produce, such as field-grown fruiting crops like tomatoes and peppers, due to insect and disease pressures. · There is a mounting interest in growing Hydroponically and Aquaponically for more controlled growing conditions. MA'O Organics’ motto is "no panic, go Organic". MA'O's mission is to empower young people to become leaders and to make their island home a more food-secure place to live. 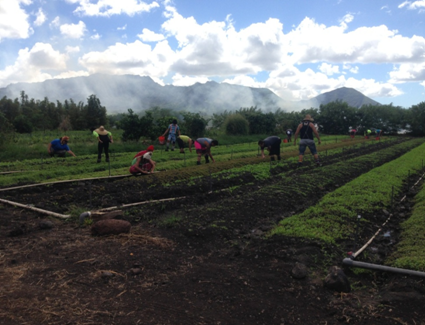 The organization is in its 10th year of offering Youth and Leadership training internships for 17-24 yr-old Hawaiians who are pursuing Agricultural Studies. Beginning with a two-year Youth Leadership Training, interns can go on to a second two-yr Step Up Training. After completion, Graduated interns can choose to go on to admin work, or to become co-managers and managers at the farm. The diverse produce raised on the 23-acre farm is distributed through a local CSA as well as to markets such as Whole Foods and Foodland in and around Oahu. Stay tuned for part two of Lainie's Hawaii Blog series- coming soon! My better half and I went to Hawaii for our wedding trip in 1976 and saw every one of the islands with the exception of Maui. We returned 9 years after the fact and went through a month on Maui and cherished it. If this is your first time get to all islands on the off chance that you spending plan online assignment help uk permits. At that point return years after the fact to your most loved one.